I flew with Flybe from Southampton Airport which was very convenient for me. I decided to just take hand luggage, which would have been ok but I found that the liquid restrictions did cause a bit of a problem. I would recommend decanting some creams and perfumes into small pots as the 20cm x 20cm bag is not very big when you put in creams, toothpaste and perfumes etc. The flight itself was very comfortable and quick - less than 1 hour. The cabin staff were very helpful and friendly. When I first boarded the Amadeus Silver II, I was very surprised by that the ship was 443ft long. 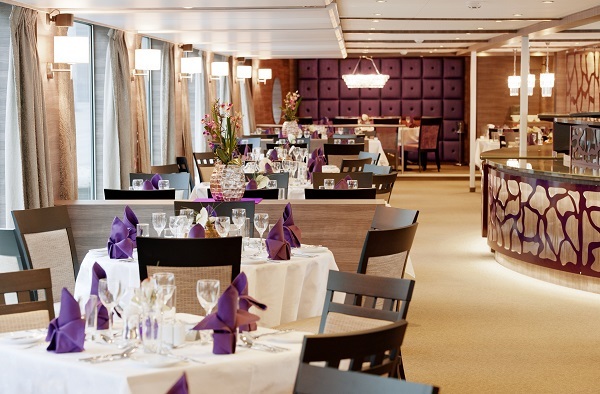 The decor was very modern and bright, with purples, creams and dark wood on the interior. My cabin was located on the middle deck, also known as Strauss deck. I found it quite large at 188sqft and it had a spacious walk-in wardrobe with a full-length mirror inside. The bathroom had a full-size walk-in shower and there were complimentary natural products like shower gel, body lotion, shampoo and conditioner. The thing that impressed me the most was the French Balcony. This was a window that would go down at the press of a button to give you a balcony that you could sit next to and watch the views go by. The communal spaces were also well thought out. The restaurant was light and airy with panoramic windows and the lounge was the same. We had afternoon tea here and this was also where you would have the entertainment in the evening. At the rear of this, there was an outside space where you could smoke is you wanted to. At the top was a sun deck that was the whole length of the ship with ample tables and sunbeds. Incidentally, the bridge was on this deck and we were told when they are traversing the rivers with low bridges that the whole of the top deck is hydrologically lowered, including the bridge, railings around the deck and the gazebos. The trip included a canal cruise showing the museums and other places of interest around Amsterdam. We also cruised from Amsterdam to Hoorn aboard Amadeus Silver II and enjoyed a Dutch gin tasting. I very much enjoyed the cruise to Hoorn. The weather was beautiful and, as we were coming into dock, we were greeted by a very picturesque view of this quaint town. We could see all the traditional buildings and the locals enjoying a relaxing Sunday afternoon. The only thing that I and a few colleagues mentioned was it would be a good idea for the ship to have tea/coffee making facilities in the room. There was a 24-hour tea/coffee station on the top deck but you would have to get dressed to make it and bring it back to your cabin. I would definitely recommend this trip or similar to anyone going on holiday, regardless of whether they have taken a river cruise before. It is a leisurely way of seeing the beautiful cities of Europe and beyond. 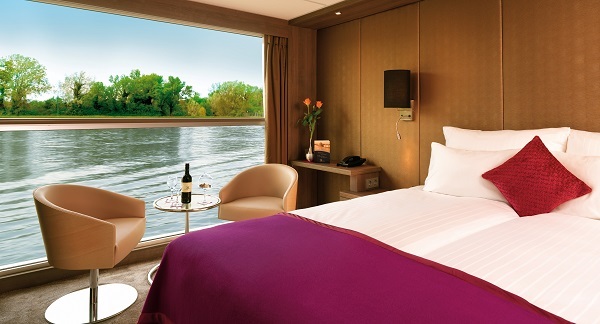 If you would like to experience a river cruise like the one that Martine enjoyed, we have many different itineraries available on waterways around the world. Come and see us at your local branch, we have travel agents in Suffolk, Norfolk, Essex and along the south coast.